Q1 : The graphs of y = p(x) are given in following figure, for some polynomials p(x). Find the number of zeroes of p(x), in each case. Q1 : Find the zeroes of the following quadratic polynomials and verify the relationship between the zeroes and the coefficients. 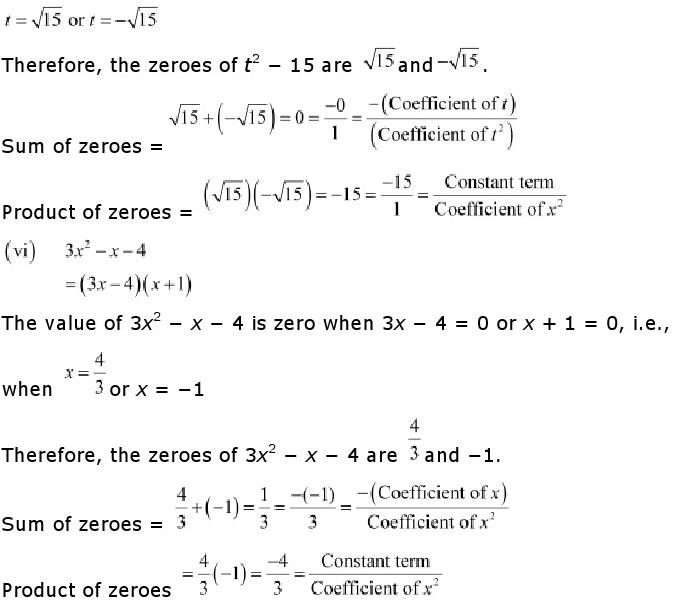 Therefore, the zeroes of are 4 and – 2. Therefore, the zeroes of 4s² – 4s + 1 are and . Therefore, the zeroes of 6x2 – 3 – 7x are . Q2 : Find a quadratic polynomial each with the given numbers as the sum and product of its zeroes respectively. Therefore, the quadratic polynomial is 4x2 – x – 4. Therefore, the quadratic polynomial is 3x2 – x+ 1. Therefore, the quadratic polynomial is x2 – 1+ 1. Q3 : Obtain all other zeroes of , if two of its zeroes are . As it has the term , therefore, there will be 2 zeroes at x = – 1. Hence, the zeroes of the given polynomial are , – 1 and – 1. Q4 : On dividing by a polynomial g(x), the quotient and remainder were x – 2 and – 2x + 4, respectively. Find g(x). = Thus, the division algorithm is satisfied. Let us assume the division of x3+ 1by x2. Therefore, , 1, and – 2 are the zeroes of the given polynomial. Comparing the given polynomial with , we obtain a = 1, b = – 4, c = 5, d = – 2. Q2 : Find a cubic polynomial with the sum, sum of the product of its zeroes taken two at a time, and the product of its zeroes as 2, – 7, – 14 respectively. Q3 : If the zeroes of polynomial are , find a and b. Hence, a = 1 and b = or- . Q4 : It two zeroes of the polynomial are , find other zeroes. Given that 2 + and 2- are zeroes of the given polynomial. For finding the remaining zeroes of the given polynomial, we will find the quotient by dividing by x2 – 4x + 1. Hence, 7 and – 5 are also zeroes of this polynomial. Q5 : If the polynomial is divided by another polynomial , the remainder comes out to be x + a, find k and a.